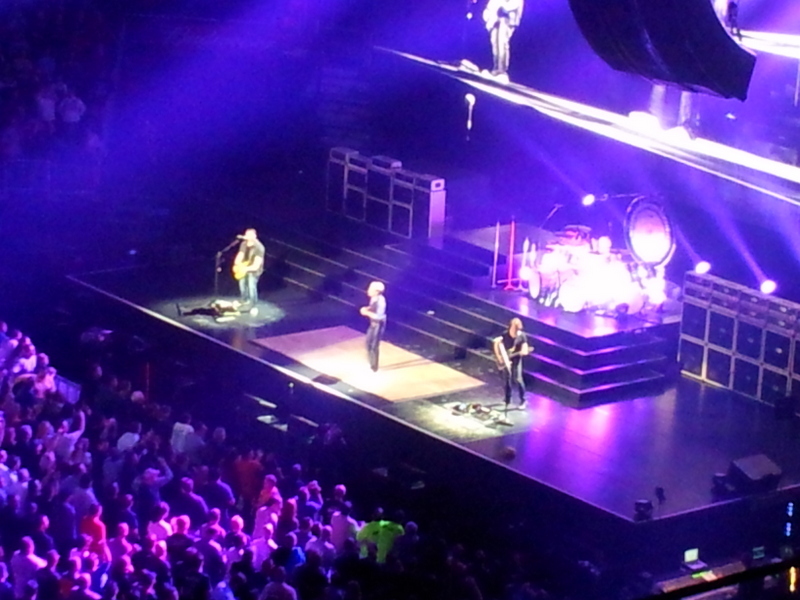 Date night last night at the Verizon Center was spent in a musical time warp, journeying through decades passed. KOOL and the Gang opened the stage, all nine guys in their shiny sleek bell bottoms swinging in sync to their classic seventies tunes. I have to say, my husband and I, both in our forties, chuckled at the thought of seeing Kool and the Gang in the twenty-first century, but, the two original brothers, in their mature years, revitalized their band with a few young bloods. It was almost as if the younger singers were trying hard to keep up with the highly energized musical talent of the older generation. The music was timeless and the audience immediately fell into the magic with tunes such as Celebrate, Jungle Boogie, and Ladies Night. Meanwhile, we were really looking forward to seeing the reinvented version of Van Halen and enjoying a wrinkle in time so to speak, for I am sure that my husband and I sport a wrinkle or two more than we did back in the eighties. My husband is still a groupie for a few dated bands that have managed to survive through the years, but, I have not really gone to see a full blown rock concert since my single days and early years of marriage, pre-children. We have maybe matured to smaller venues with less flash, but, for some reason there was a part of me that was quite curious to see how a band popular in the eighties would sound today. David Lee Roth, whose leather studded pants could have been painted on to his middle aged bod, opened with Changes and soon after, Dancing with the Devil. Sliding across the stage, sporting a cropped rocker doo, his voice boomed out tunes from our high school days. The audience was soon heated up and in the groove, as Roth mopped his face with rock star scarves that seemed to magically appear, only to soon be soiled and tossed into the audience for someone to catch and auction on ebay. The stage hosted Alex Van Halen on drums, Eddie Van Halen on guitar and his son, Wolfgang on bass. Eddie still has it, cool as can be, cranking out the sound that turned him into a legend. Wolfgang is a young addition much in need of crafting his own style. He lacked any unique contribution, for his vocals were drowned by the elders and his musical style blended into the background. David Lee Roth, a mere fifty seven years old, performed with the energy of a teenager. He slid, he kicked he spun and he even pirouetted on stage turning his famed rock and roll numbers into a bit of a rock ballet. As much as I grinned to myself at his performance, wondering how a middle age man was going to pull off a young rock and roll act, I found myself unable to avert my eyes. Diamond Dave is a limelight kind of guy and he deserves it. Even when he, for a brief moment, forgot the lyrics, he merely laughed, admitted his mishap and turned to the audience for help. The audience chimed in and Dave was back on course, leaping across the stage, twirling the mike stand as if it was his silent dance partner. But, I must say, a few of the songs just sounded out of place in the current line-up, for how strange it was to hear the middle age band members reciting songs such as: Hot for Teacher and lyrics that mentioned teenage girls. It sounded a bit perverse and no longer bad boy-ish. Sorry. And there was the uncomfortable moment when David Lee Roth grabbed his crotch a couple of times, a move that I personally associate souly with Michael Jackson and him alone. With three boys in my household, I can do without the crotch grabbing at a musical venue. There was a slightly strange and sullen moment where Dave decided to reflect on his maturity and show video in the background of his pet sheep dogs rounding up cattle in the fields of Indiana. I guess this is where Dave goes to chill out when he’s not strutting around promoting an album or trying to preserve a period in time that can be somewhat reproduced, but, not relived. Love it Julie! I am now a follower! Great meeting you Saturday, you are a very talented lady!